Oasis LS Crewe - Mens is rated 4.8 out of 5 by 130. Rated 4 out of 5 by launa from Great baselayer I've replaced all my synthetic base layers with Icebreaker and it was a great decision. I've worn this top multiple times on snowboarding trips and it never stinks like my old base layers did. While I still recommend, I'd really like to see Icebreaker design a version of this top with thumbholes and add 2 inches in length because it doesn't stay tucked into my snowboard pants. Otherwise, it's great. I have very sensitive skin and typically hate wearing wool, but merino wool from Icebreaker is very soft and comfy. Rated 3 out of 5 by Strider from Breezy bare belly button Nice texture but unimpressed; ultimately am returning this product because it's a belly top on my 6" figure (my measurements say small, I bought medium, need XL to cover my stomach) and will probably be trying the men's heavier weight version as they look longer and come in nicer colours. Unrelated to fit, but a repeated beef I have with almost all outdoor brands, and will write in every review until I see a change: Please make nice, muted colours for women too! 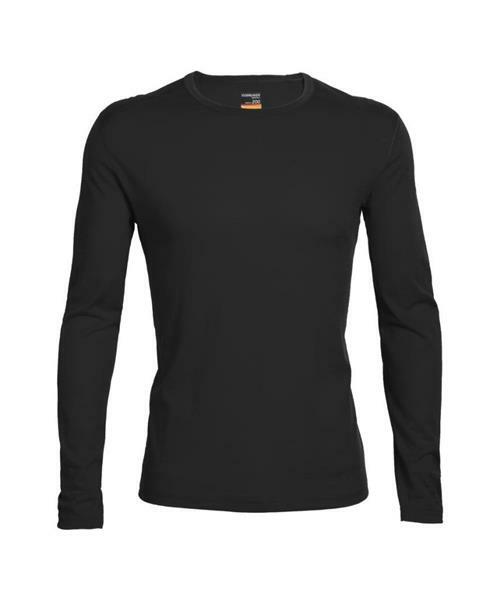 I live in base layers as I work outdoors and find it hard to find anything to spice up my drawer of identical black and grey tops. All I want is the muted greens and (not even slightly pink) burgundies that rule the men's section. Usually we're stuck with pink or black, which is just sad. Rated 5 out of 5 by IBYearRound from Iblover This top is cozy, soft, warm and perfect for wearing alone or under something else for extra insulation. I have two and they take turns keeping me warm every day in the winter, and often through the rest of the year. The first one I bought was Med (I’m 5’4” and 135 lbs - long waisted - and 63 years old!) and it was too body-hugging for me. I exchanged it for a large and am very happy with it. It isn’t baggy at the neck and the sleeves are a good length. Nice length for tucking, or not. Rated 5 out of 5 by WCTMom from Survived the West Coast Trail Wore this shirt every day of my 7 days on the West Coast Trail. Perfect light weight warm layer either over my t-shirt for starting out on cool mornings, snack or lunch breaks and under my puffy in the cool evenings and mornings. Not only was I very pleased with it's performance, it was flattering, looked great on and held up very well with no signs of wear at all. After 7 days it no longer smelled fresh but it wasn't offensive either. I sized up to allow for a bit more ease and layer over a t shirt. Rated 4 out of 5 by IBYearRound from Perfect all 'round top I love the colour and the style and will love the shirt when it arrives in the right size .... for me! I'm 62, 5'4", 135lbs and don't want tops that are form fitting. I ordered a M size, but found that the "mature softness" ;) of my tummy was too noticeable for my comfort level. (btw, I consider myself to be in good physical condition for 62, and have an active lifestyle) So, I have returned it, after going carefully through the "fit chart" (something I should have done before ordering). I await the L which I think I will wear a lot because it will feel less "revealing". I plan to wear it for everything, from day to day around the town, to outdoor adventuring combined with another layer of IB on top. I'm trying to be patient while the return/exchange is being processed. Rated 4 out of 5 by Taibhsearachd from So Far So Good I purchased this shirt a few weeks ago as a replacement for another brand of merino long sleeved crewe. My old one lasted all of a month before it started getting holes in it. This one is a bit of a heavier weight, and so far I love it. It is pretty much the only thing I wear when not at the office. It's been great for hiking as it keeps me warm at the beginning of the trail but doesn't allow me to get overheated once I've worked up a sweat. I have only washed it by hand once, but I am hoping this shirt far outlives my old one. Rated 5 out of 5 by Mogy from Absolutely LOVE this shirt! I recently purchased the Oasis long sleeve crew in Midnight Navy and I absolutely love everything about it. It fits and looks fantastic on, the colour is great, and the fabric is very soft and comfortable. Even though it is marketed as a base layer, it is dressy enough to wear around town. So far, I've discovered it is super functional for hiking, mtn biking, and travel. I know this is going to become one of my favourite "go-to" pieces for my adventures. I'm definitely considering buying another one in a different colour! Rated 5 out of 5 by treehugger from Great versatile shirt Good quality shirt for work, travel and hiking on weekends. I have just bought my second Oasis shirt. The first one is about one year old and still looks great. Very expensive, but the quality is superior to the cheaper alternatives. Whish the logo on the sleeve was less prominent. I have been a loyal icebreaker customer for a while, but could do without wearing a promotional material on the sleeve.